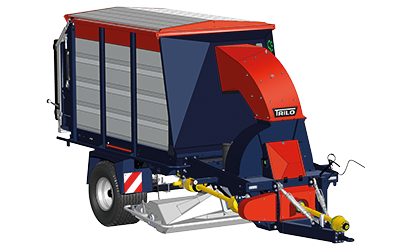 Compact and manoeuverable machines with a loading volume of 8 – 12 m3 that allow you to sweep and collect leaves or grass clippings in one pass. Despite their compact size, they have a large loading capacity that reduces the time spent driving back and forth to and from an unloading location. A powerful fan provides enormous suction power and is mounted in a housing with a replaceable lining. The fan is driven by a PTO drive shaft attached to the tractor and requires an output of The required hp PTO can vary depending on the working conditions.75 – 110 HP (55 – 81 kW). Because the shaft in the suction hood is exchangeable, compact vacuum sweepers can be configured for several jobs. Extra wide radial tyres and an optional swing axle with four wheels in line, ensure a very low ground pressure. • Sweeping and collecting in one pass. • Extra wide radial tyres for low ground pressure. • Optional swing axle – four wheels in line. • Drive by PTO drive shaft. • Usable all year round for several jobs. • Ability to work longer due to larger loading capacity.